Martha sheds light on the world of grains and recreates a traditional savory porridge while playing with preparations for kamut and roasted vegetables, mixed-grain pilaf with chicken, and herbed barley salad with dates. 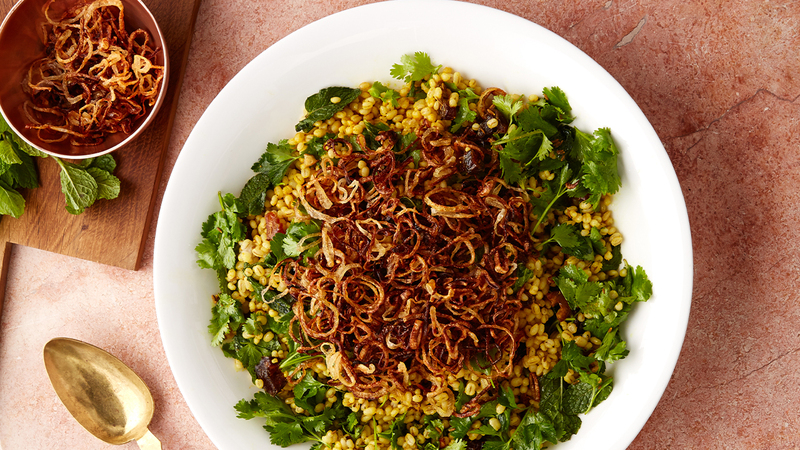 So, revive your grain game with Martha’s inspiration from the Arabian Gulf. This herbed barley salad with dates recipe appears in the "Cooking with Grains" episode of Martha Stewart's Cooking School. Bring barley and 3 cups water to a boil in a medium saucepan. Add 1/2 teaspoon salt. Cover, reduce heat, and simmer until barley is tender, about 40 minutes. Drain if necessary and let cool. In a medium skillet, toast cumin seeds over medium heat until fragrant, about 2 minutes. Remove from skillet and set aside. Add oil and shallots to same skillet and heat over medium. Cook, stirring occasionally, until shallots are golden and crispy, about 9 minutes. Transfer to a paper towel-lined plate; reserve oil. Combine turmeric, lemon juice, and reserved toasted cumin seeds and oil; season with salt and pepper. Add to barley along with herbs and dates. Stir to combine. Transfer to a serving bowl and top with crispy shallots.